Driving Biological Projects are selected to drive technological developments at NRAMM. We have supported ~20 of these projects over the past 4 years. Many of these projects are facilitated by a graduate student or post-doctoral fellow creating a tight bridge between the technological advances at NRAMM and the needs of a biological research group. The projects can be loosely divided into three major technology driving categories. In category number 1, are a group of projects that present unusually complicated systems for single particle analysis, mostly because of a very high degree of heterogeneity. These included: studies of influenza virus ribonucleoprotein (RNP) complexes that revealed the architecture and organization of the native RNP and suggested a mechanism for viral replication (Moeller, Kirchdoerfer, 2012); characterization of an E3 ubiquitin ligase that plays a role in cotranslational protein quality control (Lyumkis, Doamekpor, 2013); analysis of an activated form of a DNA nuclease that revealed an unusual mechanism of enzyme activation and explained its oligomerization and allosteric behavior (Lyumkis, Talley, 2013); structural studies of the NO-signaling pathway (Campbell, Smith, 2014; Campbell, Underbakke, 2014); application of hybrid methods to understanding ribosomal 30S subunit assembly (Sashital, Greeman, 2014); assessing protein movements related to the mechanism of human dyneins (Bhabha, Cheng, 2014). The second category of DBPs included a set of projects that drove our technology to aspire to the highest possible resolution structures using the instrumentation available to us at various times. 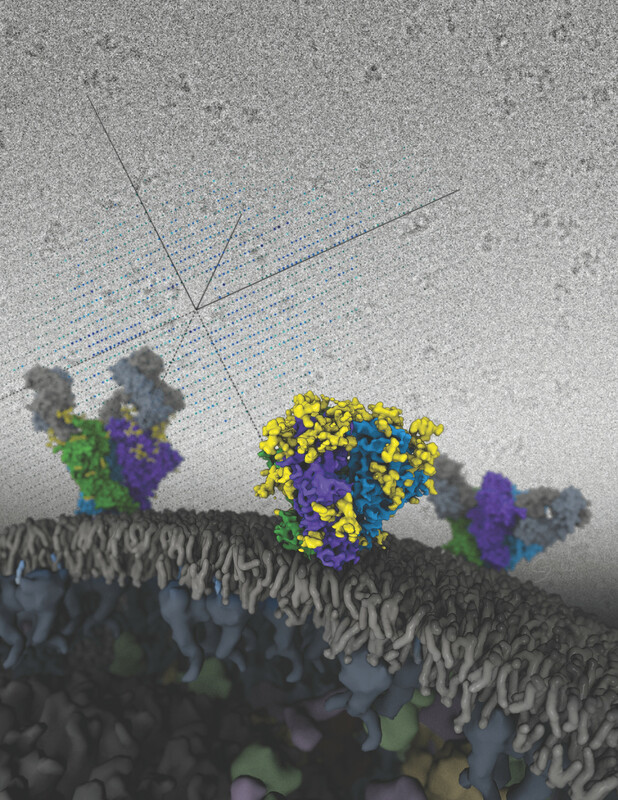 These included: the reconstruction of an HIV Env trimer that provided insights into the interaction of the trimer with broadly neutralizing antibodies (Lyumkis, Julien, 2013); understanding the structural basis for translational surveillance by the large ribosomal subunit-associated protein quality control complex (Lyumkis, Oliveira Dos Passos, 2014); structural studies of bacteriophages (Veesler, Quispe, 2012) (Lander, Johnson, 2013). The third broad category was a variety of projects related to using EM to study integral membrane proteins (IMPs) including: optimizing a newly designed beta-strand peptide that stabilized IMPs and provided improved visualization of small flexible molecules (Tao, Lee, 2013); delineating the entire conformational spectrum of two homologous ABC exporters (MsbA, PgP) under the influence of nucleotide and substrate binding (Moeller, Lee, 2015); structural analysis of Nicotinamide nucleotide transhydrogenase (Leung, Schurig-Briccio, 2015); characterizing the overall architecture of rhodopsin bound to arrestin (Kang, Zhou, 2015); understanding the domain structure of the full-length glucagon receptor bound to peptide ligands (Yang, Yang, 2015).